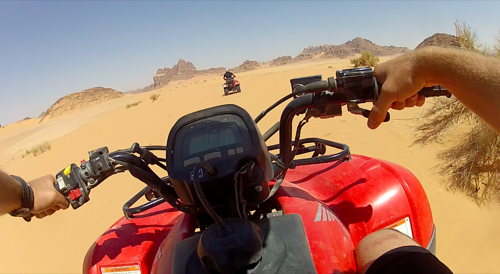 Jordan – the unofficial gut-wrenching adventure capital of the Middle East. As part of a partnership with the Jordan Tourism Board, Nerve Rush lead adventurer Joel Runyon just returned form a 7-day trip experiencing a whirlwind tour of the country’s adventure activities. 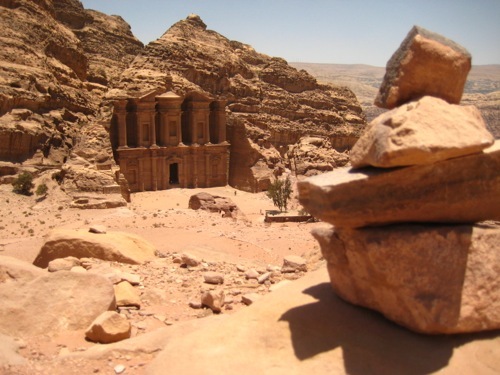 The best known site in Jordan – Petra is absolutely incredible. While the canyon walls and rock faces will amaze you on your way up to the Treasury, you’ll also find the city has much, much more to it. There are multiple day-long hikes you can take through the city, whether you want to climb the 900 steps up to the monastery and possibly find some ancient Transformers or do the much longer trip to Aaron’s Tomb, you’re going to find yourself admist some amazing vistas and canyons. The only thing that would make it better? A zipline or some paragliding adventures to take you to the bottom once you reach the top. We know it’s a UNESCO protected area, but we still think you should think about it at least :). Ever wanted to be an astronaut, head off to space and drive a lunar rover across the moon? This is about as close as you can get. Wadi Rum is an adventure seeker’s paradise, sporting high rock faces and sand dunes from millions of years ago. What used to be underwater is now a desert – and an awesome one at that. Grab your ATV and head out on a tour – flying through the desert, ramping off natural hills and bombing down sand dunes – this might be the most fun you can have with a trillion pounds of sand (approximately) and a gas tank. I mean, watch this video and tell me it doesn’t look incredible. Yes, Wadi Rum IS that cool; we included it twice. in the summer out of the year. But, after a pilot testing in 2012 where they were operating at almost 100% capacity for the entire length of the operation – they’re planning on expanding it to more times throughout the year. If you get the chance – take it – it’s like skydiving on the moon. When’s the next time you’ll have a chance to do that? The operation is top notch and the production values on some of the media you’ll get from your jump is incredible so be sure to reserve your spot beforehand and show up early. 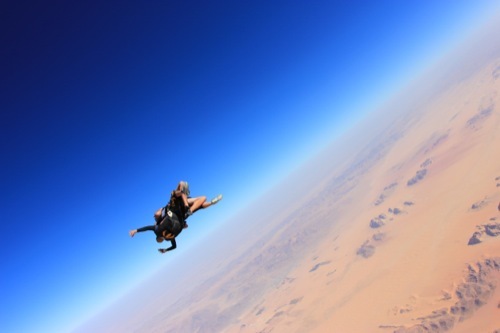 Do a tandem jump w/ a friend or get your AFF certification – it’s as close as you’ll get skydiving the moon until NASA gets its act back together and starts realizing how awesome that would be. Wadi Mujib is the world’s lowest reserve – located at about 400m (1200 feet) below sea level – just next to the Dead Sea. Sporting some incredible vistas and amazing waterfalls – this is an adventure hikers dream. You’ll start off dry, but that will change quickly – so be prepared to get WET. As you start waking up the river, you’ll quickly find yourself in the river, climbing waterfalls, and even swimming at some points to get farther up river. On some of the longer hikes you can either choose to go abseiling or rappelling down the side of a waterfall so you can practice your Mission Imposible stunts. Yes, that’s as cool as it sounds. The Red Sea gets its name from the variety and abundance of coral in the stunningly clear deep blue water. As a result, this makes for some incredible snorkeling and scuba diving. 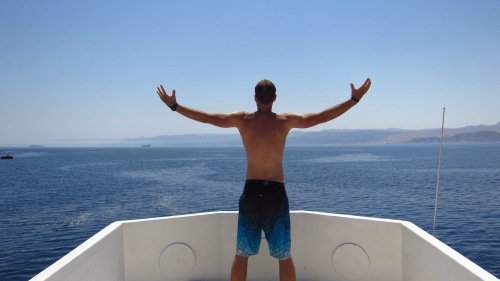 Not only can you see four countries in one spot (Jordan, Israel, Egypt and Saudi Arabia), but you’ll see some of the best snorkeling around, filled with colorful coral, amazing fish of all kinds. As a bonus, you’ll find the water is filled with jellyfish – of the non-poisonous variety – but jellyfish none-the-less. So while they may sting you if you touch them, they’re nothing compared to the deadly ones out of Australia or other countries that your friends may have heard of. This is a great opportunity to pick one or two up and practice your jellyfish juggling skills, snap a photo and impress your friends without telling them that they’re non-poisonous. Ever wanted to drive a dune buggy? Okay, lets rephrase that – ever wanted to FLY a dune buggy? We thought so. Check out the microlight – a miniature flying machine that takes you back to the origins of flight and takes you above our favorite place in Jordan – that’s right – Wadi Rum. The views are incredible, the experience is one of a kind and by the way – you’re experiencing the miracle of flight. #BOOM. Did we mention this is in Wadi Rum? Man, we love that place. Think camels were just cool for Aladdin? Think again, next time you’re out in Disi, and want a more local version of horse track racing, check out the camel racing, place your bets and pick your camel. To be honest, we have no idea how to actually tell which camels are faster than the others, but our current completely unscientific theory has our money on the camels with one hump being faster (more aerodynamic, right?). Photos by Sean Ogle, king of HDR photography. Boom. But that’s not it. Jordan is teeming with adventure. Get out there, explore and stay adventurous. Disclosure: Joel spent a sponsored week in Jordan with the Jordan Tourism Board experiencing many of these adventures first hand. Jordan is a country I’ve become very interested in visiting given many of my blogger friends have gone there recently on sponsored trips. It’s great that it caters also to the adventure enthusiast. I’d love to try Camel Racing. 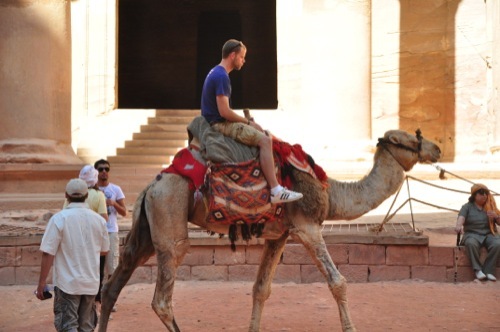 Glad We could send Joel there to report — had no idea Jordan was such a thrill-seeking kind of destination. Of all the countries I’ve visited, Jordan is the one I most want to go back to. I went to Jordan in 2010 and loved, would love to go back if I get the chance.